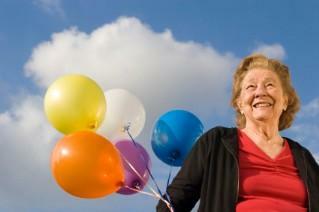 Retirement marks a major milestone in life and should be recognized in a memorable way. If you are hosting a party for the retiree, be sure to begin planning early so you can commemorate this momentous occasion for your colleague, friend, or family member so no detail is overlooked. Surprise: Whether or not you make the party a surprise party is up to you. Keep in mind the guest of honor and what you think he would most enjoy for the party. If you know for sure that the person is not fond of surprises, do not throw him a surprise party. You may ask his spouse or a close friend if a surprise party would be appropriate if you're not sure. Larger parties often do not work well as surprise parties. Formality: The formality of the event depends on the person for whom you are throwing the party and the industry in which she or he worked. For example, a more introverted person may enjoy an intimate luncheon with friends and co-workers, while an outgoing extrovert would love to be the center of attention at a large evening bash. If the retiree is someone who is in management at a conservative corporation, a more formal dinner party may be appropriate. Those in theatre, advertising, or other creative jobs may enjoy a more relaxed party. One of the first things to do when planning a party is to comprise a guest list. If you are close to the retiree, this should be a simple task. If you are uncertain as to who to include on the list, you may want to ask him or her for assistance. 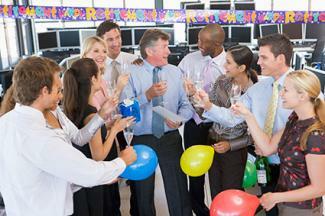 A retirement party is generally hosted at the time of a person's retirement. While some parties can be held several weeks in advance, it is best to wait until the person's employment has ended. Try to host the party within the next week or two. 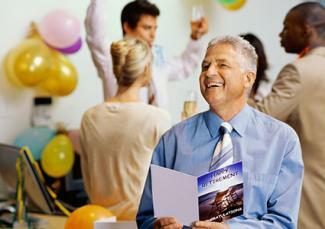 The best parties are held the day of the retirement or the following weekend. The party is used as a send-off to retirement and the closer to the actual time of their departure from the job, the better. The venue can be selected according to the size of the party and the type you plan on hosting. After-hours cocktails and appetizers at a favorite bar with co-workers and their wives may be perfect for the sports agent who only has around 20 people on his list, but a large group of over 50 usually requires a bit more planning. Most retirement parties are a dinner accompanied by a "roast." The roast will serve as the theme for the evening. 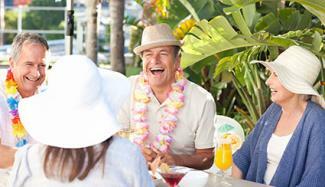 At a roast, guests can take turns telling funny stories about the retiree. Guests may choose to talk about an appropriate yet embarrassing moment at work or talk about something that was typical behavior of the guest of honor. A roast is a great way to honor the retiree while adding a touch if humor to their departure from the job. Hawaii: You could plan a Hawaiian luau and serve tropical drinks with fun umbrellas and island themed food such as pineapple, pork, grilled chicken skewers, fresh fish and Hawaiian sweet bread. Be sure to decorate with lots of tropical flowers, fake palm trees, grass skirts, tiki torches, coconuts and leis. Mexico: The retiree may love traveling to Mexico. Create a Mexican fiesta. Display a brightly colored piñata, play Mexican or Spanish style music and toast the guest of honor with a margarita. Food can be arranged on a buffet and include the usual Mexican fare of chips and salsa, tacos, nachos and fajitas. Decorate with bright colors such as orange, red, pink and yellow. Accent the room with sombreros and chili peppers for a festive touch. Another retirement party idea is to create a commemorative look at the retiree's accomplishments. Put together a video about the retiree. Have friends, family and co-workers give a tribute to the retiree on the video. Gather photos from the place of employment from the past to the present. Decorations can be a mix of photos and items from the various decades and years that the retiree worked at his or her job. You can present the retiree with a special scrapbook of memories as a gift for their retirement as well. For the golfer, tables could be decorated with golf teas and flags. Centerpieces could be vases filled with golf balls. A gift certificate to a golf shop or for a round of golf would be the perfect gift to complement the theme. A nautical themed party is necessary for any boater. Decorate with sand, seashells and lighthouses. Display a photo of the guest of honor on their boat as a focal point. A card player themed party could be something as simple as setting up card tables and using decks of cards for place cards. Scatter poker chips and dice around the tables to complete the look. Have guests play cards as the main activity. Keep food and drinks easy and fast, so you can also enjoy the party. No party is complete without food. The amount and kind of food you choose to serve really depends upon the retirement party itself. Informal parties like backyard barbecues often are served buffet style, with hot dogs, cookies, chips, salad, and cake. Formal events often have a served three-course meal, like Caesar salad, main dish of chicken Marsala with a steamed vegetable side, and a retirement cake for dessert. Regardless of the food served, the cake to commemorate his/her retirement should be festive. Have it shaped or designed to relate to the industry from which he/she is retiring. Alternatively, have a simple elegant scroll design with the saying "Congratulations on Your Retirement" with the date and person's name. Best Wishes on Your Retirement, Tony! Here's to Your 30 Years! Most retirement parties rely on toasting as their main form of entertainment. The host of the retirement party will often serve as emcee. Those who toast may include the guest of honor's boss, a co-worker, and either a spouse/child/close friend. If you are retirement party planning, be sure to ask people with enough advance notice for them to get a short toast written. Usually, special entertainment is reserved for the largest of the parties. Parties where friends, co-workers, and family are invited for an evening meal may have a disc jockey or small band play songs during dinner, with a short dance to follow. If you are planning a work retirement party, is it customary to give the retiree a small gift or token of appreciation from the company. This can be along the lines of a watch, cuff links, or electronics device. If you work in a specific industry, it may relate to the job, too. Friends and family members or co-workers who want to give the guest a gift may want to consider pooling their money and purchasing something the retiree would enjoy now that he/she has finished work. A year-long country club membership, golf clubs, or continuing adult education classes in a fun course may be something the retiree would enjoy. Individual gifts are not customarily given; however, if you would like to give a small gift certificate for dining at his/her favorite restaurant, that is entirely appropriate. In most cases, a well-thought out card and your heartfelt best wishes are suitable. Regardless of the type of party you host for the retiree, it is sure to be an unforgettable affair with some simple planning. Give yourself plenty of time and don't be afraid to ask for some help. The more people you can have helping you out, the less stressful the process will be. The guest of honor will appreciate all of the party planning that went into the festive occasion.